The First Thirty Years of "Kelly"
Kelly Turner spent 43 active years on the Navy List. He left his mark on the Navy and on his brother officers, both seniors and juniors, for he flayed about a bit in our Navy. But most of all, he flayed the Japanese, from early August in 1942 until mid-August in 1945. When Kelly finished with the Japanese, they were licked. When Kelly finished his active service and moved on to the retired list of the Navy, the Navy was not licked, but it was quieter and never quite the same. This is the story of a man who once he bit into something, would not let go. Let us look into Kelly Turner's family origins to find a clue explaining this characteristic. His forebears, the Kellys and the Turners were an energetic and a restless lot. They moved out of the British Isles and west across the Atlantic Ocean. They kept moving west across the New Country until the Pacific Ocean barred further western movement. Then they churned up and down the Pacific Coast. The particular Turner progenitors with whom we are concerned migrated from Westmoreland in Northwest England prior to the middle of the 1720's and settled on the Chesapeake Bay side of the Eastern Shore of Maryland. They received a 12-mile square land grant in Caroline County between the Choptank River and Tuchanoe Creek. This is about 50 miles, as the crow flies, due east of the Capitol in Washington, D.C. The Turners had been farmers and millers in England and they were farmers, millers and traders in Colonial Maryland. They also were Protestant and members of the Church of England. John Turner, great grandfather of Richmond Kelly Turner bit into Methodism in 1765. This outraged the elders of the clan, who gave John the hard choice of reconverting or losing his land heritage. He was a good alligator, gave up his land heritage, and stayed a Methodist. This decision entailed a short move westward in Maryland to Talbot County on Chesapeake Bay. In 1827, a little over a hundred years after the Turners had first settled in the New World, young farmer John Turner,3 grandfather of the Admiral, up anchored from Maryland and moved west. He first settled south of Columbus, Ohio, near Circleville, and then in 1833 in Whitley County in northeast Indiana. Here, on 10 April 1843, Enoch Turner, father of Richmond Kelly Turner, was born. In 1844, the John Turners moved on westward to Iowa. Five years later the big decision was made to undertake the long overland trek to California after a preparatory winter period at Council Bluffs, Iowa. Departing on 3 April 1850, in company with a family named Blosser, and proceeding via Salt Lake City, the John Turners with six children arrived in Stockton, California, in late August 1850. They brought supplies for the gold mines in what were the latter days of the "Gold Rush." For some months after arrival, John Turner continued in that freighter trade, although the older sons engaged in gold mining on the north bank of the Calaveras River, near San Andreas, California. The family then reverted to farming, first on a section of land in San Joaquin County (where the town, Turner, named for the family lies on Route 50), and then, 20 years later, near Woodville in Tulare County in South Central California. moved to Oregon after the Civil War, during which his mother had died.4 His brother Thomas was a printer on the Portland Oregonian. On 2 July 1867, Enoch married Laura Francis Kelly5 in East Portland. He was 24 and a school teacher at the time. The tradition of large families was carried on by Enoch Turner and Laura Kelly. Grandfather Samuel Kelly had had 12 children and the Clinton Kellys 13. Great grandfather John Turner also had had 12, and in turn, his son, John Turner, had had nine children. Eighteen years after the marriage, on 27 May 1885, Richmond Kelly Turner was born in East Portland, Oregon, the seventh of eight children, three boys and five girls. Grandfather John Turner was 85 when this grandson was born. He was to see the young alligator when, in the next year, he persuaded his son, Enoch, to return to California to help him run his ranch near Woodville, which was becoming a burden because of his years. The 19th century Turners were a severe clan. They raised their children in the tradition of "Spare the rod, and spoil the child." They were always moving westward toward more primitive living conditions. As farmers and ranchers, they battled nature for long, long hours each day, and with very few mechanical assists. These stern conditions left a mark on the Twentieth Century Turners. In the early 1750's the Colony of Virginia recruited many Scots, Irish and Germans, recently arrived in the New World, to settle on the western border of Virginia to form barrier communities against Indian attacks. One of the Irish so recruited was Thomas Kelly who moved to Botetourt County (north of Roanoke) where he farmed his homestead. Thomas Kelly fulfilled the purpose of his recruitment when he participated in the French-Indian Wars of 1754-1760, during which France and England fought for the control of the Ohio Valley. Certificate #5808 of the Botetourt County Court, Virginia, now in the possession of the Turner family (and sighted by the author), certifies that he served as a corporal in the militia of Virginia and in Captain Dickenson's Company of Rangers for the protection of the Colony of Virginia during 1757, 1758, and 1759. The fighting capabilities of the Irish found further employment during the Revolutionary War, when Thomas Kelly served in Moylan's Cavalry, Continental Line, Fourth Pennsylvania Regiment of Light Dragoons. As partial compensation for these services, Thomas Kelly received a grant of land in Greenbrier County in the western part of Virginia (now eastern West Virginia). February 1776, was married to a Nancy Canada at Clifty Creek, Pulaski County, Kentucky, on 3 September 1807. Nancy Canada was ten years younger than her husband, having been born 7 April 1786. In 1847, Grandfather Clinton Kelly, the eldest son of the Samuel Kellys was 39.12 He lost two wives through early death, and had married a third, Moriah Maldon Crain, on 11 March 1840. She bore the future mother of the Admiral. Clinton Kelly was a successful farmer, a lay preacher in the Methodist Church, and dead set against the practice of slavery. He made the quite natural alligator decision to hold on to his belief and to leave the slave state of Kentucky and move on westward to territory where slavery did not exist. Clinton Kelly and two brothers, Albert and Thomas, built wagons, collected horses, oxen and necessary traveling effects, and in the fall of 1847, the three families went to Independence, Missouri, to make final preparations for an overland trip to The Dalles, Oregon, the next spring. 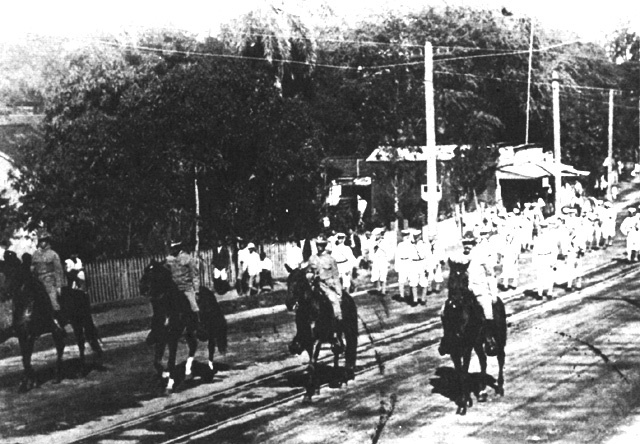 On 1 May 1848, accompanied by four other families, they set out in 12 wagons. The first night a bad hailstorm scattered the stock. All the stock were later found except those belonging to Albert Kelly, so Albert turned back. The remaining six families, with Clinton Kelly as the leader of the caravan, made the trip successfully, shipping their freight by raft from The Dalles to Oregon City, Oregon. In the spring of 1849, Grandfather Kelly bought 640 acres of land in what is now East Portland, Oregon, for 50 dollars, and planted a crop of potatoes.13 Grandfather Clinton Kelly became a leader in his community, and remembering that he had given the land for the first school, a grateful East Portland named a high school after him, "The Clinton Kelly High School of Commerce. "14 The 227th ship launched by the Oregon Shipbuilding Company during World War II was named the Clinton Kelly.15 The Clinton Kelly Memorial Church is a lasting monument of his zeal and of his assurance of the vitality of his Christian faith. Laura Francis Kelly, Mother of the Admiral and the fourth child of Clinton, was born in Pulaski County, Kentucky, prior to the movement of the family to Oregon. The John Turner Clan and the Clinton Kelly Clan each were closely knit clans. When Richmond Kelly Turner died, the Kelly Clan, in annual meeting assembled, passed a proper memorial resolution, stating that it was "Fitting and proper that the members of the Kelly Clan take note of his passing and briefly review his life and career." 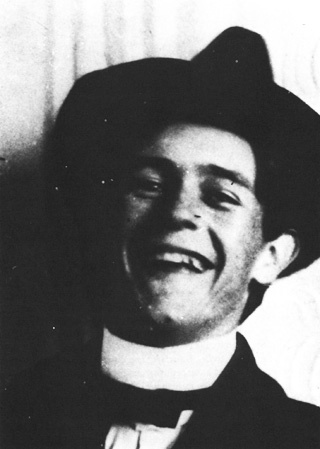 Richmond Kelly Turner at fifteen, 1900.
typesetting and later editing a small weekly in Fresno, during which time, he attended school there. In 1900, the San Francisco Examiner. as a circulation promotion project, sponsored the holding of a competitive examination amongst boys from the eighth grade through junior in high school, in the Examiner's circulation area. Subjects covered in the examination were United States History, Civics, and English Composition. This will introduce to you Mr. Richmond Turner who is desirous of entering your High School. He is within a month of promotion from our Junior Class. As a student, he is strong, thorough, and painstaking. Had he remained with us until the end of June, he would have been promoted to the middle class with honorary mention. We regret to part with such a student and feel sure that you will find him a young man of marked ability. 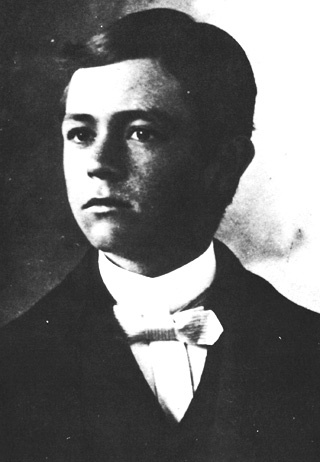 Richmond Kelly Turner at his high school graduation, 1904.
by the Secretary of the Navy; but so that ultimately each Senator, Congressman, and Delegate might recommend one person for appointment as midshipman during each Congress.24 So Congressman Needham's vacancy was similar to one which many Congressmen had in the year 1904. Despite this hazard and that of having to name in proper order all the waters passed through in making a voyage from Yokohama, Japan, to Saint Louis, Missouri, via Hongkong and the Suez Canal, 297 physically qualified young Americans took their places in the rear ranks of the Regiment of Midshipmen during the summer of 1904. Among them was Richmond Kelly Turner, who had done very well in all subjects except geography, in which he had perhaps failed to mention the Straits of Bab-el-Mandeb as he entered the steaming waters of the Red Sea, en route to far away Saint Louis. Richmond Kelly Turner became a midshipman on 13 June 1904. He was erect, long limbed and slender (6 feet, 13/4 inches tall and 150 pounds), black haired, well featured, and sober faced. When the Class of 1908 entered the Naval Academy in 1904, Captain Willard H. Brownson, U.S. Navy, was Superintendent. Captain Brownson, U.S. Navy, was a well-known naval figure, destined to have the distinction of continuing on as Chief of the Bureau of Navigation for some five months and 16 days after his retirement for age. Two years previously (by Act of Congress approved 1 July 1902) the title of the young gentlemen under instruction at the Naval Academy had been changed from naval cadets to midshipmen. The latter name had a long seagoing background, while the word "cadet," in use only from 1883 to 1902, was strictly Army in its connotations. The change was both welcome and sensible. And the previous year, the Congress had further provided that all candidates at time of examination for the Naval Academy, must be between the ages of 16 and 20, instead of between 15 and 20 as had been prescribed since the Act of 4 March 1889. This latter change tended to equalize just a bit the educational level of the entering midshipmen. from 1845 and the "New Quarters" dating from 1870, were being replaced by Bancroft Hall, a large dormitory named after the 1845 Secretary of the Navy, George Bancroft. Large classroom buildings with commodious and modern teaching facilities and named after naval officers who had made their mark in the educational (Mahan), inventive (Dahlgren), engineering (Isherwood), or command aspects (Sampson, Schley) of the Navy, were growing apace. The Old Academy was a hodgepodge, in arrangement of buildings, in types of architecture, and in the varying inadequacies of the facilities. But the primary reason for the complete rebuilding was to be found in the blossoming of the United States into a world power under the leadership of Presidents William McKinley and Theodore Roosevelt. To provide the military power to support its new world position, the Navy was being expanded. The Secretary of the Navy would soon report to the President that "Never before were so many warships launched by this or any other nation in one year. "28 And never before had there been so many midshipmen under instruction at the Naval Academy. paternally molded into Midshipman Turner, United States Navy, within the Academy walls. Physical hazing of plebes was a problem at the Naval Academy in 1904-1905 despite the fact that the Congress recently had passed a law forbidding it, and the official naval policy, as well as unofficial officer belief were strongly against it. 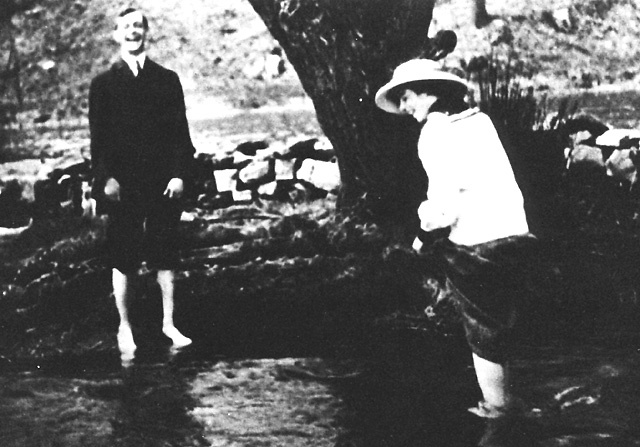 Meriwether of the third class (1908) arising out of hazing administered to Meriwether by Branch during 1908's plebe year. From then on throughout Midshipman Turner's second and first class years, there was no general physical hazing of plebes. Most of the stuff in the papers is a pack of lies. . . . But mental hazing or "running" of plebes continued throughout his four years as a midshipman. The urgency of the need for additional junior officers to man the ballooning number of ships in the Fleet was brought home to the Naval Academy when the first class (1905) was suddenly graduated on 30 January 1905, four months ahead of time. While the second class (1906) took over the duties and privileges of the first class, this only resulted in a change to stronger and more high-handed masters for Midshipman Turner and his fellow plebes, despite the Superintendent's belief that "No case of hazing has occurred during the past year." The Class of 1908 remained in its lowly state both in name and in privileges until June 1905.40 Of the 297 plebes in 1908, 256 finished Plebe Year successfully and became "youngsters." Eleven obtained 85 percent of the maximum mark of 4.0 and "starred." 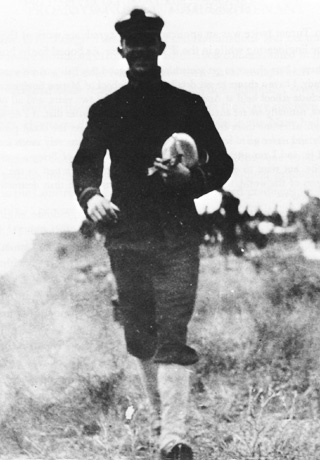 Midshipman R.K. Turner stood 14th. He stood number 1 in English and Law, 17 in Military Efficiency, 23 in Modern Languages, but only number 111 in Conduct. 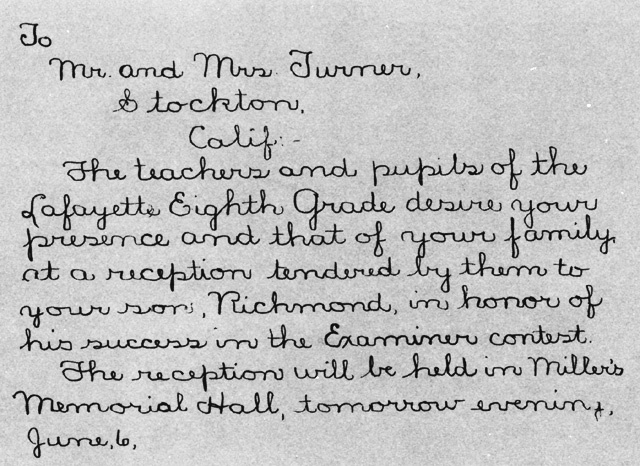 At the end of the Plebe Year, one of Turner's classmates who played a major role in World War II was "found deficient, allowed an examination, passed and continued with the class. "42 This was Mark A. Mitscher who encountered later academic difficulties and, after "taking the six year course," graduated with the Class of 1910. Though the new Academy is by no means near completion, some of the buildings not having yet been started, even in its present condition the magnificence of the finished project can be clearly discerned. With the passing of the Old Academy, not only the old buildings have disappeared, but also the old customs and the old life. The 1905 Summer Practice Cruise for the midshipmen of the Naval Academy was made by the 6,000-ton second class battleship USS Texas (Flagship), four monitors, the USS Terror, USS Arkansas, USS Florida, and USS Nevada, two small cruisers, the USS Newark and USS Atlanta, the old but famous USS Hartford, and the Naval Academy Station Ship, the USS Severn. The last two had sails only.44 Even without the Severn and Hartford, this was a patch-work of ships of rather varied formation keeping qualities. These ships, except the Naval Academy Station Ship, normally comprised the Coast Squadron of the North Atlantic Fleet. Rear Admiral Francis W. Dickens, U.S. Navy, was the Coast Squadron Commander. Rear Admiral Robley D. Evans (Fighting Bob) was Commander in Chief of the North Atlantic Fleet. However, the cruise was notable for one reason. From 7 June 1905, to 17 June 1905, the Practice Squadron held Joint Exercises, or "war maneuvers," with the United States Army in the Chesapeake Bay area. This exercise fitted into Naval Academy drills which "Sometimes included practice amphibious landings across the Severn River. "47 Before they finished their careers, these fledgling officers were to hold many more Joint Exercises with the Army--a few in World War I and many in World War II. The event of plebe year, however, that remains most vivid in our minds today was the Army game; it was then we first felt the call of the Navy and realized that we were in it and for it. How we cheered and yelled and, yes, cried as the Army defeated us 11-0 in a hard fought game. In 1905, the Navy continued active in Santo Domingo, and the Navy received a new Secretary of the Navy, Charles J. Bonaparte. It is reasonable to anticipate that their numbers [of ships in our Navy] will be reduced, and even reduced materially, within the next five years. had spent 27 years of commissioned service before reaching, in 1903, the comfortable grade of commander where he was to enjoy only four brief years in this grade. Six commissioned line officers and two past midshipmen formed the 3,200-ton Denver's complement of line officers. Today's destroyers of only slightly greater tonnage have a complement of not less than 17 commissioned line officers. Besides the two foreign ports ("Madeira, the place seemed like God's own garden," and "of all the ends of the world, Horta is the worst") the midshipmen visited Frenchman's Bay and Bar Harbor, Maine; Newport, Rhode Island; and New London, Connecticut. The Second Class Cruise was marked also by "unpleasant memories of rolling ships, wave-swept decks, and of future admirals manning the rails wishing only to die, with the winds howling through the rigging in derision." The Midshipmen Squadron Practice Cruise on the way to the Madeira Islands had to heave to while the storm abated. Along with most of his classmates, Midshipman Turner suffered the experience of being seasick the first time he was in a real North Atlantic storm. His recollection of it was vivid. You know there are twelve grades of wind, from No. 1 a light breeze to No. 12 a hurricane. The storm we had was a No. 10 and lasted six days. Oh it is great to be out on the bounding, pounding, howling, raging deep at such a time--just fine! I know of no pleasure greater than to be gazing down into the green, foamy, crawling shining water and wonder if the fish that got your last meal enjoyed it any more than you did, and you know there's no help for it either; you know that the blooming old ship won't go down and so give you a little relief. Those old freaks who decided that hell is of fire, had it all wrong. I'm sure it's much more like a storm at sea on a warship. When you realize that on one day we constantly rolled over to an angle of 37 degrees on each side of the perpendicular, perhaps you can imagine that a sailor's life is not what it's cracked up to be. Well you never saw half as busy a man as I am now, and as l expect to be all the rest of the year. I have written over fifty letters in the last week and a half to other colleges and universities concerning games for our baseball team next spring . . . and on top of this, I have been trying to get the work on the "Lucky Bag" well underway. This is rather hard to do. It is a thing that must be created rather than just put together. . . .
Only 14 midshipmen were dropped out of the 1908 class during Second Class Year. Midshipman Turner still stood number 7, and was the last man to achieve the enviable stars on his collar that denoted academic excellence. Other than in conduct, in which he stood number 65, he was not lower than 27th in any subject. The visit to Jamestown was occasioned by the 1907 Jamestown Exhibition and participation by the Midshipmen Practice Cruise in "the most noble pageant of recent years," a Fleet Review by President Theodore Roosevelt. The Class of 1908 made its pleasant but unglamorous First Class Midshipmen's Practice Cruise during the summer of 1907 in three monitors, the Arkansas, Florida, and Nevada, all less than five years in commission, and in Dewey's flagship at the Battle of Manila Bay, the fine armored cruiser Olympia of 8,500 tons. The famous Olympia, initially commissioned on 5 February 1895, mounted what, in 1907, was still considered a modern battery, consisting of four 8-inch 35-caliber guns and ten 5-inch 40-caliber guns. Harry Booth Hird who stood number 14 in efficiency and graduated number 30 in the class was the "Five Striper" and Midshipman Commander of the Regiment of Midshipmen, and Edmund Randall Norton who stood number 39 in efficiency and graduated number 2 in the class was the other "Four Striper" and in command of the 1st Battalion. Midshipman Turner was a very busy young gentleman his First Class Year. Besides the detailed tasks which any battalion commander has in controlling and leading four hundred young Americans, he was editor of the Lucky Bag, the annual of each Naval Academy graduating class. Because of this assignment, he enjoyed "late lights," and the privilege of working after the 10 p.m. taps for "All Hands." The effort was rewarded by a class standing of number 4 for First Class Year, and number 5 for the four-year course. The Academic Year was also one of constant physical change in the Naval Academy as old classroom buildings on the prospective sites of new ones had to be torn down, so that classes were shifted from here to there to meet the day-to-day situation. The Class of 1908 was the only class during the period from 1901 to 1908 to graduate as a unit in the month and year anticipated at the time of entrance of the class into the Naval Academy. During most of these years, the muster role of the Regiment of Midshipmen and the midshipmen officers therefore were as flexible and fast moving as an accordion. Mid-term graduations took place in 1905 and there were two graduations in 1906 and 1907, with the size of the Brigade and its midshipmen leaders changing accordingly. Something there is more needful than expense. from California, with the Westerner's frankness and good nature love of adventure and fondness for the good old American game of 'draw' [poker] . . . Has served the class well in different capacities and is deservedly popular . . . A busy man, with hardly time to catch a smoke . . . A good athlete, but doesn't like to train . . . An all-around man and a good fellow. A classmate, and the first officer in 1908 to attain the rank of Four Stars and as such to command a fleet in World War II, remarked regarding their Academy days. We shall feel that our work has not been vain, if perchance it helps you of 1908 to realize the true worth of Friendship and the part it plays in the life of the Class, the Academy, and the Service. Midshipman Turner left Bancroft Hall and his four years as a midshipman with a good taste in his mouth. It is most interesting and entertaining too. If the handsome young faces carry out their indications, there are fine men in the Class, and our country will be the safer for them. With heartfelt good wishes for you and for the "Class of 1908,"
More than a fair share of the heavy cream of the Line officers of the Navy of the ranks from lieutenant to commander were to be found at the Naval Academy. This is evidenced by the fact that during the period 1904-1908 a total of six future Chiefs of Naval Operations and/or future Commanders in Chief of the United States Fleet were on duty at the Naval Academy among the 58 to 65 Line officers instructing midshipmen in professional and cultural subjects and in the Command and Discipline Department. 65 Line officers instructing midshipmen in professional and cultural subjects and in the Command and Discipline Departments. The number of future Flag officers among the 58 to 65 Line officer instructors varied from 18 to 23, depending upon which of the years from 1904 to 1908 is chosen.83 Any naval command with a nucleus of from 30 percent to 40 percent potential Flag officers is fortunate indeed. This fact indicates the great importance attached 50 to 60 years ago to the training of midshipmen. Victory at sea in World War I, World War II, and the Korean War can be attributed, in a considerable measure, in this writer's opinion, to the excellence of this fundamental schooling and training, and the high caliber of those managing and conducting these tasks. I have requested to be assigned to duty on the Colorado, an armored cruiser, now on the Pacific Coast. She is one of a squadron of eight ships and this squadron is expected to be sent to China in the Fall, so I'll probably be able to see you then, as they will visit Manila, of course. 50-caliber guns; her secondary battery of eighteen 3-inch 50-caliber guns and twelve 3-pounders. This vast array of 44 topside guns caught the eye immediately. There was a promise of plenty for a young man with a first-rate mind and a strong body to learn and do. And it can be assumed that Captains Charles A. Gove and Charles C. ("Squinchy") Rogers, both of the Class of 1876, and both later Flag officers, were quite determined that the four or five past midshipmen in the Milwaukee's officer allowance would carry their share of the load. In 1908, midshipmen successfully completing the course at the Naval Academy were ordered to sea duty in a semi-probationary status for two years before being eligible for a Presidential commission as ensigns in the United States Navy. They were officers in a qualified sense, were titled "Past Midshipman" and were subject to much rotation in their divisional assignments on board ship. They received continued close supervision in endless hard work, minor personal consideration, and tantalizingly small pay ($1,400.00 per year). Their rewards included a possible rearrangement of relative standing on the naval list with their classmates, based on performance of duty when promoted to ensign, denial of the normal ten percent increase of pay for officers serving at sea, and denial of permission to marry. But Congress was slow to move on the recommendation of the Navy Department and the Class of 1908 served their two years as past midshipmen -- officers, but not commissioned officers. 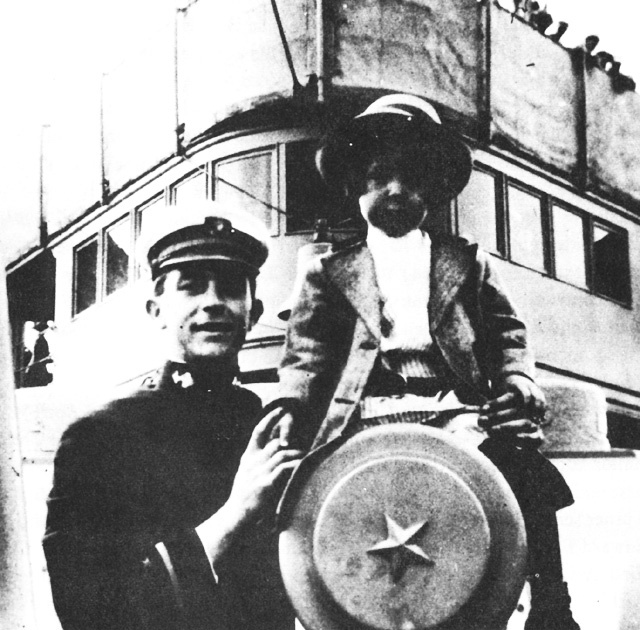 Past Midshipman Turner served in four ships during his first year out of the Naval Academy, and it was not until he arrived in the roomy 13,680-ton armored cruiser West Virginia in July 1909, that the Bureau of Navigation let him stay long enough to really make his mark. During this first year, and after spending four months in the Milwaukee, Past Midshipman Turner happily served for seven weeks in the 270-ton harbor tug Active (YT-14) at the Mare Island Navy Yard. Here, he was reasonably close to Stockton and the love of his life. Then he was bounced back to the Milwaukee for a short month and in January 1909 was assigned for six months to the Preble (DD-12), one of the 16 original torpedo boat destroyers of about 480 tons authorized by the Congress during the Spanish American War, and whose keel had been laid down way back in April 1899. Duty in the harbor tug Active was in the combined billets of Executive Officer, Senior Engineer, and Navigator; and in the Preble and Davis in the combined billets of Executive Officer and Engineer Officer. But me for a cruiser every time. The officers are a bunch of drunks. They keep their white clothes in their trunks. They stand their watches in their bunks. In the Armored Cruiser Squadron. In the period of our Navy when there was a touch of truth as well as a touch of poetry in this doggerel, Past Midshipman Turner and then Ensign Turner stood out as one of the low powered beacon lights, in the Armored Cruiser Squadron and in the good ship West Virginia. In a Navy that was officially wet, and unofficially dripping in spots, he drank hard liquor very sparingly, he worked unceasingly, he had brains and applied them, and he kept his eye on the true gunnery target -- progress of the Navy. In a period of our Navy's long history, when there was no selection for promotion to any rank, when seniors were apt to spread the cold truth and nothing but the truth on officers' semi-annual fitness reports, when ship's companies were small, and every officer was well known to his captain, the fitness reports of this young officer; while lacking the whipped cream topping of the fitness reports of the ensigns of the 1960's, were indicative of the Navy's best young officers of any year or age. As a makee learn officer, he was a captain's dream of what a young officer should have -- interest, brains, and a willingness to work. The trip down to Admiralty Islands was more in the nature of a reconnaissance than anything else. Strictly on the q.t., the United States Government is on the lookout for more coaling stations in this part of the world, and those islands seem to promise well, if we can only buy them from Germany, which I doubt very much. There were times in the years ahead, when he might have wished to question this last judgment. However, in another four years Lieutenant (junior grade) Turner would become the number one Line officer in the Class of 1908 in the Naval Register -- when one officer senior to him resigned his commission and the other three Line officers his senior transferred to the Naval Construction Corps. His marriage in early August 1910 increased Ensign Turner's financial problems with only a small measure of surcease from the larger pay check his commissioned rank carried. His pay now totaled $170 per month as an ensign on sea duty with over five years' total naval service. Just before Midshipman Turner graduated, the Congress on 13 May 1908, had been pleased to grant a very small increase of pay to a limited portion of the Naval Service, the first pay increase since 1 July 1899. The new pay law increased the pay of Midshipman Turner from $500 to $600 per year, of Past Midshipman Turner from $950 to $1,400 per year, and of Ensign Turner from $1,400 to $1,700 per year. The past midshipmen were judged to have been extremely fortunate, since commanders and captains at sea continued to draw for another 12 years the same meager base pay as they had under the old 1899 pay bill. I have a position carrying papers at $3 a month. Saturday, I bought a hat $1.85, two shirts @$.50, and [spent] $.45 on the trip to and around San Francisco. He early learned the availability and uses of credit by the officers and gentlemen of the Naval Service. Each of his 1909 to 1911 letters available have some mention of financial problems. Nevertheless, his concern in regard to these never matched his pleasure over career successes in the Navy, and did not approach his concern over the care and happiness of his wife, who closely balanced the Navy as his main source for continued happy living. The Navy continued to satisfy the Turner clan's basic need to be on the move. The West Virginia continued to cruise about the Pacific Ocean; the Navy continued to use the Naval Academy marking system where 4.0 was the mark for perfection; and Ensign Turner continued to receive 3.8's, 3.9's, and 4.0's and complimentary remarks from his Commanding Officers in his fitness reports. In late 1911, the West Virginia, as part of the Armored Cruiser Squadron, took part in the ceremonies in connection with the first opening of what was to become Ten-Ten Drydock, the 1,010-foot drydock at Pearl Harbor. The Davis was only 50 paces (148 feet) long and had but 1,750 horsepower in her Lilliputian engines to provide her with 23 knots. The Preble and Stewart were a hundred feet longer, displaced 420 tons and needed all their 7,000 horsepower to make 28-29 knots. The torpedo boats normally had an ensign and a past midshipman aboard while the larger torpedo boat destroyers required two commissioned officers and one past midshipman to keep them operating now and then. Gradually over the next few years Ensign Turner read all of Mahan's main works and listed this fact in the appropriate place in his fitness report. His commanding officers in the torpedo boat destroyers, only a class or two senior to him, were duly impressed and continued to sprinkle a generous quota of 4.0's on his fitness reports and always reported him "forceful, active, and painstaking." three useful characteristics for the naval officer. acquire an excellent "Service reputation" and the three stripes of a commander. There was some very thin ice which he barely and luckily got over, while serving on a staff and while in command of a destroyer. Breaking through thin ice in the Navy during this period was not only dangerous, it was darn likely to be fatal. For during this period, the Navy, many years in advance of the Army, fostered and adapted the selective system of promotion for all grades above the rank of lieutenant commander. The Navy had for many years required its officers to take broad gauge professional examinations upon each promotion to a higher grade. These tough examinations were highly effective in self education and in keeping all seagoing Line officers up to date in all professional aspects of their complex careers. The professional examinations covered such fringe matters as international law and military law, as well as the basic professional requirements of theoretical navigation. practical navigation, electrical engineering, steam engineering, seamanship, ordnance, and gunnery. But in addition to this self education, postgraduate instruction was open to an outstanding few in the Bureaus and at Navy Yards. The establishment of the Naval Postgraduate School in 1912 at the Naval Academy greatly expanded the opportunity for further formal education of young officers. After one year of intensive study at Annapolis, the students were sent on to Harvard, Columbia, Massachusetts Institute of Technology, University of Chicago, or the University of Michigan for their master's degree in mechanical, electrical, diesel, radio, chemical, or various aspects of ordnance engineering. In June 1913, Ensign Turner passed his examinations and became one of the 150 junior lieutenants from the Class of 1908 commissioned in the Navy. Fourteen of his classmates had resigned their naval commissions while ensigns; three had been retired because of physical disability; one had been dismissed; and one had unhappily run away from the Navy and been declared a deserter. However, the Line of the Class of 1908 in the Navy had suffered further losses. Two classmates transferred to the Marine Corps, two to the Civil Engineer Corps, one to the Mathematics Corps, one to the Supply Corps and the three who stood number 1, 2, and 3 upon graduation transferred to the Construction Corps. Out of two hundred graduates, in five short years, only 75 percent remained in the Line. On 1 January 1908, there were but 1,270 Line officers in the Navy including 307 past midshipmen. Only 84 of these were captains, and besides Admiral George Dewey there were no more than twenty other Flag officers. By 1 January 1913 the total number of Line officers had increased to 1,708.114 During the interim, Past Midshipman Turner had been examined and promoted to ensign on 6 June 1910. He was promoted to junior lieutenant on 6 June 1913. Acquiring a first flight service reputation with these 105 important people in the Navy, the captains and Flag officers, depended upon doing something worthwhile where they could see or hear about it. This could be accomplished in the Navy-wide Gunnery Competition or in the Engineering Competition which had been started in the Navy in 1902 and in 1907, respectively. It could be accomplished in command of a ship. It could be accomplished on the staff of a Flag officer. It had to be accomplished where the greatest number of officers were stationed -- that is, in the Fleet. Shore duty was a place where you prepared yourself for more effective duty afloat and got away from as soon as possible. You could lose your reputation ashore, but you could not make it there. Unless under instruction, shore duty was something you enjoyed and swept under the rug and forgot about. Ensign Turner buttered his second request for postgraduate engineering instruction with a statement that he had had 13 months and 15 days of engineering duty in his four years since graduation, and with commmendatory letters from his Commanding Officer and other officers served with in the West Virginia, Preble, Milwaukee, and Active. This yen for perpetual shore duty under the guise of being an engineer, unfortunately for the Japanese , did not live much beyond the honeymoon period. From watching the Engineering Class at the Academy for two years, I find that about twenty percent of them applied for it because they desired to make themselves better officers for the Service, the remainder because they could put themselves in a position to escape watchstanding, get shore duty out of turn, or expecting to get additional education at the expense of the Government and then resign. Ensign Turner had dreamed again about having shore duty before his initial five years' sea service was completed, and particularly he had dreamed about it in January 1911, and in May 1912, when he officially requested shore duty via the postgraduate route. However, it was not until 30 September 1913, that Lieutenant (junior grade) Turner with five years of sea service and watchstanding under his belt, reported into the Naval Academy for postgraduate instruction in Ordnance. Three years later, and after several disturbing sea duty interruptions, he had his postgraduate degree, and was headed for a job in the Gunnery Department of the Flagship of the U.S. Atlantic Fleet, the good ship Pennsylvania. However, the interruptions at sea gave him his first amphibious training, since he had been a midshipman. Lieutenant (jg) Turner almost didn't stay at postgraduate instruction. The Bureau of Navigation, having in August 1913 ordered him to postgraduate duty, five months later, discovered that he had not signed an "Agreement of Post Graduate students to serve eight years in the Navy." So the Bureau sent him the form to sign. 1. Returned herewith unsigned is Enclosure (A) transmitted to me with Bureau's letter above referred to. it. But instead, the Bureau of Navigation showed compassion and with a soft answer signed by "Victor Blue, from South Carolina too," the 48-year-old Chief of Bureau, accepted Turner's substitute statement that he had "every desire to remain in the Navy my whole life" and intended "to continue my service in the Navy of the United States for a period of at least eight (8) years." The first six months of postgraduate education flowed smoothly otherwise, until all of a sudden on 24 April 1914, Lieutenant (junior grade) Turner was detached by commercial telegram to sea duty in the 1,000-ton, 1,100-horsepower Marietta. 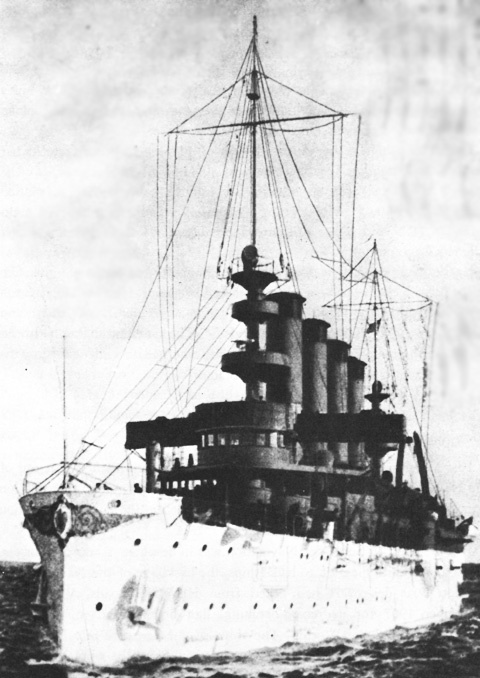 The good gunboat Marietta was part of the Cruiser Squadron, U.S. Atlantic Fleet, under Rear Admiral William B. Caperton, U.S. Navy, which the Navy Department made available to support the State Department's "Gunboat Diplomacy" in Santo Domingo in April 1914.
the total of commissioned officers to six, and Lieutenant (junior grade) Turner was the Gunnery Officer of the six 4-inch guns with which the ship was armed. Besides being given additional duty as Paymaster for the ship, when the Paymaster had to be hospitalized ashore, Lieutenant (junior grade) Turner was the Landing Force Officer. Surgeon T.A. Fortescue. This force at once occupied the northwest corner of the cement walled enclosure belonging to the Santa Fe Sugar Company in which were gathered about one thousand refugees. . . . I established outposts . . . no armed forces were within the neutral zone when the landing occurred, and none attempted to enter until about 3:30 the next morning. . . . The firing between the two forces continued briskly for about an hour and a half, many rifle bullets passing over or falling within the neutral zone. . . . There was one casualty. . . . Firing continued intermittently until moonset, at 3:00 a.m., when it increased for about an hour, and then gradually died away. . . . Occasional shots only were fired in town during the day. . . . The refugees were very much pleased that we were there; government troops with whom we came in contact were uniformly courteous. At least as much to the point were the eleven 4.0's in the Fitness Report. During this postgraduate period, Turner wrote an article published in the 20 May 1916 Scientific American titled, "The Size of Naval Guns: Are Twelve 14-inch or Eight 17-inch Guns to be Preferred?" Turner set forth the problem, explored it, and analyzed it, and without definitely saying so, seemed to favor the larger guns. Another article titled "Classes of Naval Guns" is marked "submitted to several magazines but refused." Within this same period of study and learning, Turner read papers or gave lectures before the student officers on Terrestrial Magnetism, Principles of Gun Construction, The Chemistry of Smoky Powders, and Optical Instruments and Appliances. 1. Foreign Broadcast Intelligence Service Bulletin; 28 February 1945. (a) James Turner's Bible (oldest son of John Turner); (b) John Turner's Bible from his children. Presented on his 73rd birthday 27 October 1873 (second son of John Turner); (c) B.I. Griswold, History of Fort Wayne, Indiana (1917); (d) Turner Family Magazine, January 1916; (3) Records of Caroline County, Maryland; (f) Newspaper clippings, 24 November 1879 to 19 October 1932, from various California and Ohio newspapers; (g) History of the Turner Clan as compiled by Richmond Kelly Turner; (h) Interviews with and letters of Miss L. Lucile Turner, Carmel, California, 1961-1963. Hereafter Miss L. Turner. 3. Born Talbot County, Maryland, 27 October 1800; married Mary Bodfield, 27 August 1821. 4. 3 March 1863, French Camp, California, 3 miles west of Turner, California. 5. Born 15 March 1847. Died Anaheim, California, 13 October 1918. 6. 22 December 1891, Woodville, Tulare County, California. 7. 18 October 1932, Turner's Station, California. 8. 16 November 1923, San Diego, California. Buried Parkview Cemetery, Stockton, California. 9. Interviews with Admiral Richard K. Turner, USN (Ret. ), Monterey, California, Mar. 1960. Hereafter Turner. (a)Pennsylvania Archives, 5th series. Vols II and IV; (b) Lewis Preston Summers, Annals of South-West Virginia, 1790-1800 (Abingdon, Virginia: By the author, 1929), pp. 91, 373, 379, 384; (c) James P. Haltigan, The Irish in the American Revolution and Their Early Influence in the Colonies (Washington, D.C.: By the author, 1908); (d) Laura Francis Kelly Turner, Pamphlet (Portland, Oregon: By the author, 1901). Mrs. Turner, the Admiral's mother, was interested in genealogy. Early dates in her pamphlet were based on inquiries made and data collected during a visit east in 1882. 11. Encyclopaedia Britannica, 14th ed., Vol. XII, p. 610. 12. Born Clifty Creek, Pulaski County, Kentucky, 15 June 1808. 13. Now bounded by East 25th, East 42nd, Hogate and Division, East Portland. 14. Powell Blvd. and 40th Avenue, East Portland. 15. Launched 31 July 1943. 16. Turner; Miss L. Turner. 17. Encyclopaedia Britannica, 14th ed., Vol. XIX, p. 293. 19. Family letters 1898-1940 (Miss L. Turner). Earliest letter dated 20 Nov. 1898 to "Dear Old Mama" (RKT then aged 13). 21. San Francisco Examiner, 1943; Miss L. Turner. 24. U.S. Naval Academy Register, 1901-1902, 1903-1904, 1905-1906, 1906-1907. 27. (a) U.S. Navy Department, Annual Report of the Secretary of the Navy for the Year 1904 (hereafter SECNAV, Annual Report) (Washington: Government Printing Office, 1904), p. 43, Captain Willard H. Brownson, USN, June 6, 1904 to Chief of the Bureau of Navigation in Report of Chief of the Bureau of Navigation, 1904 (hereafter CHBUNAV, Annual Report). (b) Lucky Bag (Naval Academy Graduating Class Book), 1908, p. 171. 28. SECNAV, Annual Report, 1904, p. 3. 29. U.S. Naval Academy Register, 1890-1891, 1904-1905. 30. Ships of the United States Navy were painted white. 32. SECNAV, Annual Report, 1904, p. 18. 33. CHBUNAV, Annual Report, Encl. H-2, p. 72 in SECNAV Annual Report, 1904. Commander Caribbean Squadron, Rear Admiral C.D. Sigsbee, USN. 34. (a)Ibid., pp. 5-7; (b) SECNAV, Annual Report, pp. 8, 9, 15, 18. 35. Lucky Bag, 1906, pp. 224, 225. 36. Ibid., 1905, pp. 102, 125; Ibid., 1907, p. 107. 37. (a) Naval Academy Registers; (b) Turner. 38. (a) Superintendent of the Naval Academy, Annual Report, p. 43 in CHBUNAV, Annual Report, 1904; (b) Ibid., p. 445 in SECNAV, Annual Report, 1905; (c) RKT to Mother, letter, 7 Jan 1906. "One time last year I did the sixteenth 342 times." 40. (a) CHBUNAV, Annual Report, p. 445 in SECNAV, Annual Report, 1905; (b) Lucky Bag, 1905. 41. U.S. Naval Academy Register, 1905-1906. 43. Lucky Bag, 1905, pp. 127, 146. 44. (a) U.S. Naval Academy Register, 1905-1906; (b) RKT to Mother, letter, 4 Jun 1905. 45. Lucky Bag, 1907, p. 164; Ibid., 1908, p. 276. 46. Ibid., 1906, p. 78. 47. Ernest J. King and Walter M. Walker, Fleet Admiral King, A Naval Record (New York: W.W. Norton & Co., 1952), p. 73. Hereafter King's Record. Reprinted by permission of W.W. Norton & Co., Inc.
48. Interview with Admiral J.O. Richardson, USN, Class of 1902, U.S. Naval Academy, December 1961. Hereafter Richardson. The USS Chesapeake, a steel hulled square rigger, was a training ship for midshipmen. Renamed USS Severn. 49. U.S. Naval History Division, Dictionary of American Fighting Ships, Vol. I (Washington: Government Printing Office, 1959), p. 203. 50. (a) Turner; (b) RKT to Mother, letter, 4 Jun 1905. 51. (a) Lucky Bag, 1908, p. 274; (b) RKT to Mother, letter, 7 Jan 1906. 52. SECNAV, Annual Report, 1904, p. 4. 53. Ibid., 1905, pp. 23, 25. 54. Ibid., 1905, p. 10. 55. Basic pay with allowances for a first class seaman with four years total service was $21 per month versus $246 per month today; watch and watch was normal seven days a week routine; Captain's weekly personnel inspection was held Sunday morning. 56. U.S. Naval Academy Register, 1907-1907. Those attaining an average of 85 percent wore stars on the collar of their uniform. 57. Dictionary of American Fighting Ships, Vol. I, pp. 203-222. 59. (a) Lucky Bag, 1907; and 1908, pp. 277-78; (b) RKT to Mother, letter, 18 Oct 1806; (c) Turner. 60. Lucky Bag, 1907, p. 197; Ibid., 1908, pp. 275, 277. 61. RKT to Mother, letter, 8 Nov 1906. 62. RKT to Mother, letter, 14 Oct 1906. 63. RKT to Mother, letter, 18 Oct 1906. 64. (a) Turner; (b) Naval Register, 1908. 65. Lucky Bag, 1908, p. 279. 66. Dictionary of American Naval Fighting Ships, Vol. I, pp. 189-91, 203, 207. Naval Act of 5 Aug 1882, Naval Act of 3 Mar 1885, Naval Act of 3 Aug 1886, Naval Act of 19 Jul 1892, Naval Act of 2 Mar 1895, and Naval Act of 4 May 1898. 68. Member Class of 1910 to GCD (the author), letter, 24 Feb 1962. 70. U.S. Naval Register, 1939, 1943; U.S. Naval Academy Register, 1908. 71. Piersel, now Commander, USNR (Ret.). 73. Interviews with three of eight members of Class of 1908, 1961, 1962, 1963. 74. (a) Interview with Admiral Thomas C. Kinkaid, USN (Ret.) 20 May 1963. Hereafter Kinkaid; (b) Vice Admiral J.F. Shafroth, graduated number 80 in the Class of 1908. 77. Lucky Bag, 1908, p. 279. 78. Naval Academy Register, 1904-1908. 79. CHBUNAV, Annual Report, p. 45 in SECNAV, Annual Report, 1904. 80. King's Record, p. 74. 81. Held CNO Office subsequently to that of CINCUS. 82. Held combined office and title, Commander in Chief United States Fleet and Chief of Naval Operations. 83. U.S. Naval Academy Registers, 1904-1908; U.S. Naval Registers, 1908-1936. 84. RKT to Mother, letter, 30 Mar 1908. 86. Daughter of Mr. & Mrs. John Calhoun Sterling, born Carmanche, Calaveras County, California, 9 May 1888; RKT to GCD, letter, 4 Nov 1960. 87. RKT to Mother, letter, 16 Nov 1908. On 4 June 1905 he had reported to his mother having taken to the June Ball a "Miss Ethel Naylor of Baltimore, a perfect beauty with the most wonderful eyes." 88. RKT to Mother, letter, 18 Oct 1906. 89. (a) Interview with Mrs. Harriet S. Turner, March 1960. Hereafter Mrs. Turner; (b) Miss L. Turner. 91. Interview with James M. Doyle (Class of 1909), classmate for two years, Jan 1964. 92. Naval Registers, 1907, 1908, 1909. 93. (a) Turner; (b) RKT to Mother, letter, 8 Nov 1909. 94. Extracts from fitness reports, USS West Virginia. 95. RKT to Mother, letter, 3 Oct 1909. 96. RKT to Mother, letter 28 Nov 1909. 97. RKT to Mother, letter, 3 Oct 1909. 98. RKT to Mother, letter, 28 Nov 1909. 99. RKT to Mother, letter from Olongapo, P.I., undated. 100. Dudley W. Knox, A History of the United States Navy (New York: G.P. Putnam's Sons, 1947), p. 378. 101. RKT to Mother, letter from Yokohama, Japan, 17 Jan 1910. 103. Ibid., 1908, 1909, 1910, 1911. 104. RKT to Papa, letter, 26 Dec 1898. 105. RKT to Mother, letter, 7 Jan 1906. 106. RKT to Mother, letter, 17 Jan 1910. 107. RKT to Mother, letter, 15 Dec 1911. 108. RKT to Mother, letter, 15 Dec 1911. 109. CHBUNAV, letter 6312-15, 3 Oct 1911. 110. (a)BUNAV Orders, 6312-19, 21 Mar 1912 and 6322-19, 11 Jun 1912; (b) SECNAV, N-31-H, 29 Jul 1913. 111. Fitness Reports, 1912, 1913. 112. King's Record, p. 103. Reprinted by permission of W.W. Norton & Co., Inc.
113. The Naval Register, 1914, lists 34 officers who had completed postgraduate courses in ordnance and 23 who had completed postgraduate courses in engineering, beginning with graduates of the Class of 1898. 114. Naval Registers, 1908, 1913. 115. Naval Register, 1 Jan 1916. 116.\ (a) RKT to Mother, letter, 3 Jun 1911; (b) RKT to SECNAV, official letters requesting assignment to School of Marine Engineering, 27 Jan 1911 and 28 May 1912. 118. RKT to Mother, letter from Honolulu, T.H., 3 Oct 1909. 119. Naval Register, 1 Jan 1914. 120. BUNAV letter 25545/145D of 6 Mar 1914 and RKT reply. 121. Sumner Welles, Naboth's Vineyard, Vol. II (New York: Payson and Clark, LTD, 1928), chs. XI-XIII. 122. CHBUNAV, Annual Report, 1914, p. 146. 123. Report of Lieutenant (junior grade) R.K. Turner to Commanding Officer, USS Marietta, Aug 4 1914. 124. (a) RKT Fitness Report, 9/30/14; (b) San Pedro de Macoris is on the south coast of Dominican Republic, 50 miles east of Santo Dominico. 125. Letter in RKT official personnel file. 126. Copy of SECNAV letter in RKT official personnel file.